It's time for the first update &mini-challenge! For this mini-challenge I want you to tell me your favorite and least favorite movie adaptation of a book. How I'm currently feeling: Ready to done with work so I can get to reading! Favorite book-movie adaptation: I'm a big fan of the Lord of the Rings movies, and I also think the Harry Potter movies have done a great job portraying the books. Least favorite book-movie adaptation: Now this one I can answer a lot easier. I REALLY disliked the Eragon movie (the scene with Saphira in the clouds. Really?!). But I think the one that takes the cake is Ella Enchanted. I cried when I saw it(not happy tears). It was NOTHING like the book, and I love the book so much. Now that it's been a few years since I've read/seen it I might see it again, just so I can MAYBE enjoy it as a movie, and not as an adaptation. 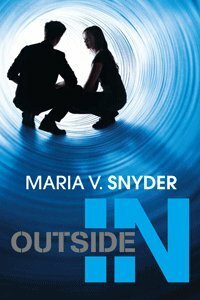 If YOU participate in this update and mini-challenge, you will be entered to win a copy of Outside In by Maria V. Snyder! Link to your post below in the Mr. Linky. If you want to link to your post, but do not want to be entered to win Outside In merely place two asterisks before your Mr. Linky entry. EXAMPLE: **Enna Isilee @ Squeaky Books will NOT enter you to win but Enna Isilee @ Squeaky Books WILL enter you to win. If you want to participate, but don't have a blog, you can comment with your answer in the comments section of THIS POST. This giveaway will only be open until Update #2 is posted at noon MST. Are we supposed to do the mini challenges on our blogs? I hope so because that is what I'm doing. I think we are unless we don't have a blog. I did mine on my blog. And here's my comment! I want to read this series! Good luck everybody! Favorite:I thought they did a good job with I am Number Four. Least favorite: I would say Avalon High but that probably doesn't really count because it was a disney channel movie so Princess Diaries because it was nothing like the book. I'm taking part in the mini challenges for fun, but not entering the giveaways as i'm international. Holding out for the international one tomorrow! If you have a blog, post updates and challenge-answers there(you're welcome to just update one post throughout the day). If you don't have a blog, comment. Make sense? Good Questions! I updated on my blog and good luck to everyone who is entering to win Outside In! I have read it and it is fantastic! I Just got inside out, so outside in would be perfect! I want to put a few updates on one post and just keep linking to that one post so I'm not clogging the feeds of my followers. Is this okay? Anybody know? Ack! Ignore my first link on this post...put it in the wrong place! I'm skipping the mini challenge, but just put up my first book review of the readathon! posted- now if kids allow it ..Back to reading!